When it comes to terrain I usually like to make it myself instead of purchasing prebuilt. There are two reasons for this, one is because I enjoy building it and two is because it is way cheaper to do it yourself. Some of my terrain is homemade and the rest of the buildings are paper terrain that I bought off the Internet. Besides your own time, paper terrain really doesn't cost very much to build. 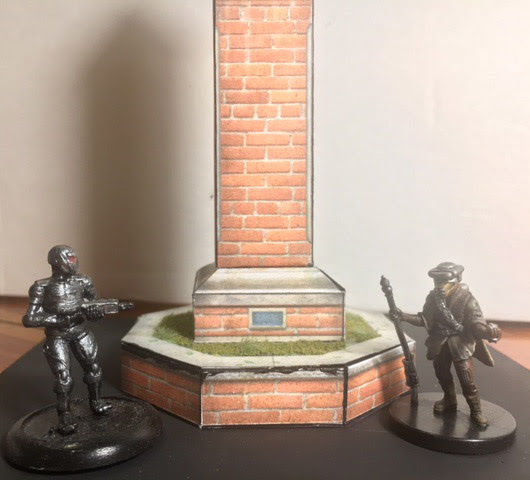 Also one of the nice things about paper terrain is that companies sometimes release a small piece of terrain for free which lets you try it out before committing your hard earned money. 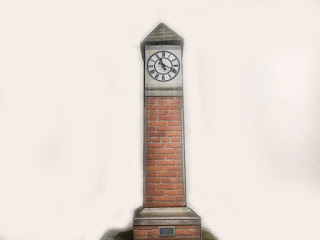 While looking for some free terrain I found a nice looking clock tower by a company called Mystic Mountain Productions. I downloaded the pdf and got to building. 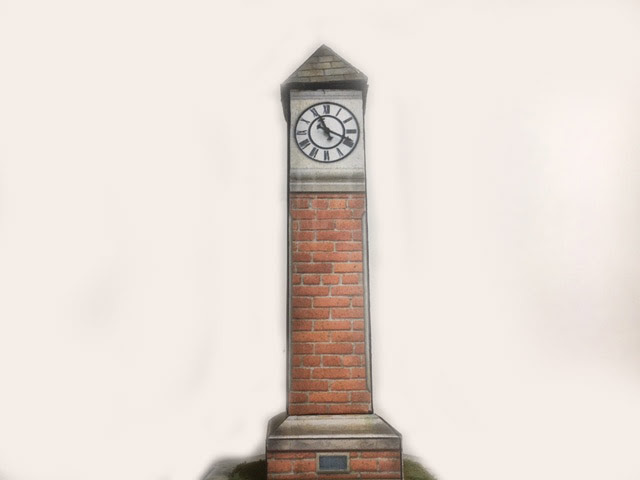 I think it came out very nice and as always any errors in my clock tower are from me and have nothing to do with the quality of the terrain. As with any paper terrain, it is a bit light making it easy to knock over while playing so I made a small base for it out of MDF to give it some weight similar to how I mounted my road pieces from World Works Games. If you look at my clock tower, the mistakes I made usually comes down to my impatience as glue never seems to harden fast enough for me. One thing I did try while building this is to clamp pieces together while they glue and that seemed to help out quite a bit. Above is the base of the clock tower. You can see some green vegetation around the base and while it looks fine I decided to add some flock and grass helped to make it pop. The only knock that I have against the paper terrain from Mystic Mountain Productions is that their terrain doesn't have any interiors. 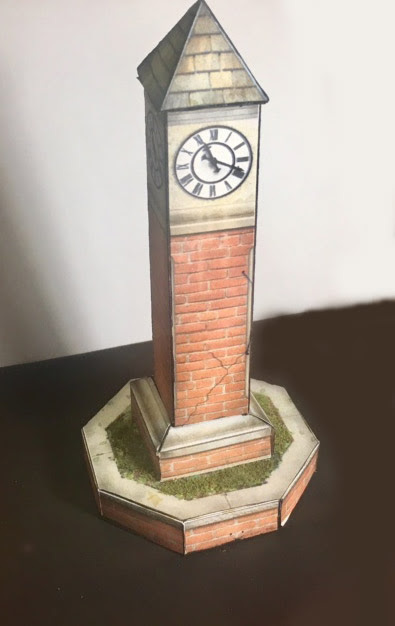 While I have enough terrain pieces that I could print and add an interior it's just too much extra work on my part also this clock tower is too small for an interior. I really liked the coliseum they offer and if I ever need one I'll definitely buy this one, I may even buy it just because it's neat looking. I think this clock tower from Mystic Mountain Productions is a very nice piece to add to your table and you can't beat the price. If you want to try it out for yourself you can download it free from Wargaming Vault.